The Supreme Court is hosting an exhibition of my photographic portraiture (see here), as part of international commemorations to mark the 800th anniversary of the sealing of the Great Charter. 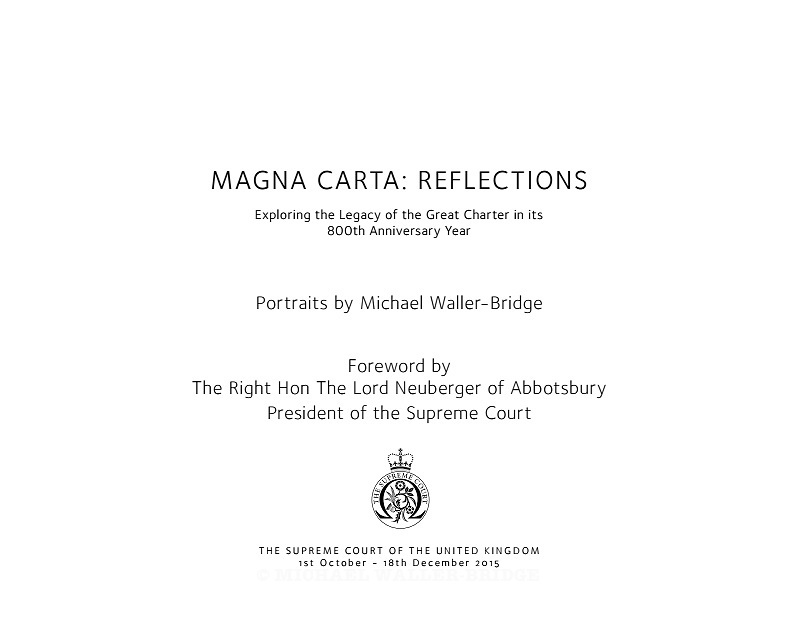 The exhibition comprises portraits of twelve figures (the number reminds us of the size of a Jury) drawn from across the legal profession, who each offer an insight into the enduring relevance of Magna Carta in their working lives through a personal statement of around 300 words which is presented alongside each individual portrait. The exhibition offers a glimpse of how the fundamental principles associated with Magna Carta influence those working in the law, from former Attorney Generals to high street solicitors. With appreciative acknowledgment of sponsor support from Amersham Investment Management. The printed catalogue comprising reproductions of all the 12 portraits and the Sitters’ associated contemplations, together with a Foreword by Lord Neuberger, President of the Supreme Court of the United Kingdom, is available for purchase here. Price GBP £12.00 plus Royal Mail 1st class postage per copy.